Bed bugs are small (5-6 mm long), flattened, oval-shaped, light brown to reddish brown insects. They are wingless, have six legs and two antennae. Young bed bugs – nymphs can be almost colourless (they get browner with age as they moult) and are much smaller than adults (1-4 mm in length). It is most likely to find bed bugs very close to areas where humans sleep. They hide very well in cracks, crevices and folded areas of beds, mattresses, sofas and adjacent furniture. Bed bugs are also found behind loose wallpaper, picture frames, skirting boards, headboards, electrical sockets, under carpets or in floor cracks. Bed bugs can be accidentally brought home from places like hotels, offices, public transport, hospitals, theatres and other public places. They can travel in our luggage, handbag, backpack, laptop case or on clothes. Bed bugs can also get in our homes on second hand furniture. Once bed bugs are in “new home” they can quickly find new hiding place. Soon they will start breeding (a female can lay up to 200 eggs during the life cycle.4-5 eggs every day). This is how bed bugs infestation begins. Bed bugs are nocturnal insects and feed on human blood – adults every 4-10 days. They prefer dark, undisturbed areas near beds, sofas, chairs etc. Bugs can find a host by carbon dioxide and warmth of human body. They bite unexposed skin – usually arms, back, neck or face. Bed bugs bites cause small, red, itchy spots. Most people don’t react badly to bites however some may show allergic reactions. Signs of bed bugs infestation. Inspect your luggage thoroughly after staying in a hotel. Before you bring any second-hand furniture, beds, mattresses, chairs or sofas, check for any signs of bed bugs. How can I rid of bed bugs? Once bed bugs problem is discovered, you will to remove it as soon as possible. Most people try DIY solutions, however they are not powerful enough to eliminate bed bugs completely. We strongly recommend to call Sun Pest Control to get expert advice. 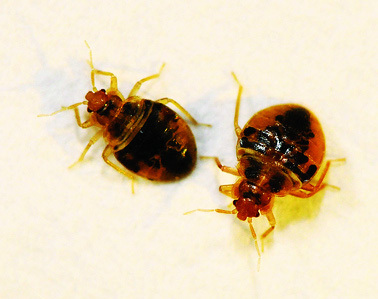 Our bed bugs treatment includes full inspection of the property and use of authorised insecticide against bedbugs. It comes with 100% guarantee witch gives you peace of mind and security. Vacuum floor and carpets and throw away used vacuum bag. HOW TO GET RID OF BED BUGS? CALL SUN PEST CONTROL FOR FREE ADVICE.